As we all know wine can be enjoyed in many situations. With friends, with loved ones, at celebration and relaxation, but a guided wine tasting in the very place that the wine is produced remains a once in a lifetime experience that will become a cherished memory for those with a lust for life. A Valpolicella wine tasting will reveal new flavors, perfumes and emotions, transmitting the beauty of the land and vineyards directly from the bottle, to the glass and finally to your soaring senses. The Fratelli Vogadori winery expertly organize a variety of different wine tasting experience and tastings of its selection of fine wines, including the Amarone, to ensure the experience wine tasting in Italy will remain one of wonder and enchantment. 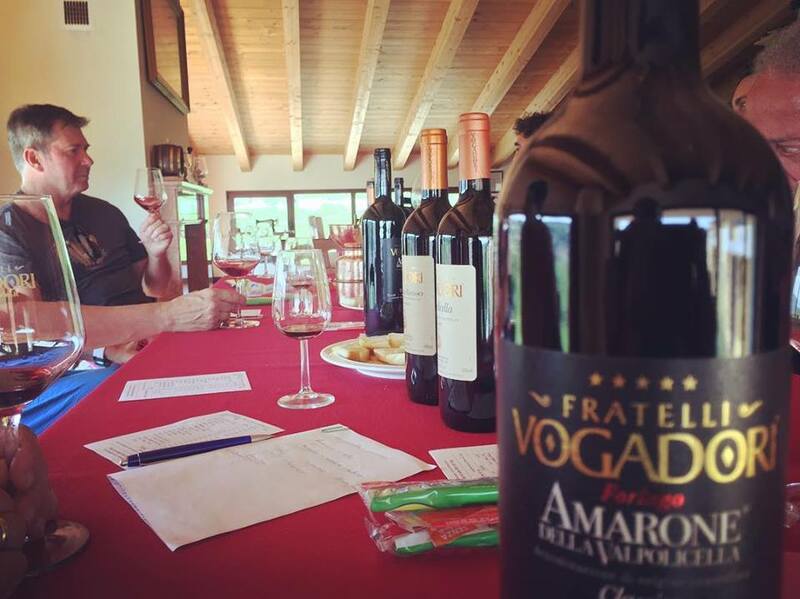 Choosing a visit to the cellar of the Fratelli Vogadori is like pouring into a glass, and savouring a concentration of the tradition and quality of the Valpolicella. The vines that produce these wines are in fact located in the heart of the Valpolicella Classica, in Negrar, a location rich in the fruits of the land, surrounded by grapes, olives and cherries. besides tasting the wines of the Valpolicella including of course an Amarone wine tasting, you will also have the chance to see for yourself the painstaking and meticulous process of producing truly excellent wine without chemical fertilisers, herbicides or Insecticides. Maximum respect for the environment is one of the Fratelli Vogadori winery’s abiding principles. Indulging yourself in one of our wine tastings is a truly unique and memorable way to embrace the history, culture and wine-making tradition of the Valpolicella. The winery is located on the hill of Vigolo in a splendidly panoramic area, surrounded by vineyards, olive groves and orchards where you can fully appreciate the Valpolicella and see the romantic city of Verona in the distance. We are sure you will agree, a truly breathtaking setting for a Valpolicella wine tasting. Our Guided tastings encompass the full spectrum of the Fratelli Vogadori wine range, from the ruby red Valpolicella Classico with its refreshing, harmonious gustatory notes, then on to the more fortified, robust Ripasso, a wine of great structure and elegance and the onward to jewel in the Fratelli Vogadori selection crown. The Fratelli Vogadori Forlago Amarone in various vintages. Then we move on to the delightfully sweet Recioto and finally the famous Grappa di Amarone, distilled from the lees of the Amarone production. On a one to one and a half hour Valpolicella wine tasting, we will guide you through the grape varieties and the wine production techniques in the comfort of our tasting room where you and your wine tasting party can enjoy a beautiful view of the valley. Wine tasting in Italy has never been more inclusive and rewarding. For this type of Amarone wine tasting and Valpolicella wine tasting it is recommended that you and your wine tasting party make a reservation. For a simple ‘drop-in’ wine tasting you are always welcome without a reservation, and can sample one or two of our wines at the counter at no cost to you. It is possible to sleep in our rooms or plan an event in the cellar!